One of the challenges of working with earth is that no two sites are the same. The recipes one learns on one site may not work on another, because the earths found there are composed differently. Most earth building relies on a mix of sand and clay, which may be present in a single earth or need to be blended together. Sand has a particular particle size and is like a rock, only smaller. You go from boulders to rocks to stones to gravel to sand to silt, or something like that. Each is a smaller representation of the one before it and just like you get many sizes of rock so you get a range of sand size. Sand particles range in size between 2mm and 0.0625mm, which is a huge deviation. The shape of sand in an ideal world should be shattered rather than rounded, such as beach sand. River sand is considered better because it tends to be more fractured so the sand particles do not slip past each other but rather build bridges and lock in together. Ideally you also want the sand to have a range of particle sizes and not just lumped on the large side, 2mm or the small 0.06mm. This is because when the larger sand particles are packed together you will have spaces in-between and you want those gaps closed with smaller sand particles. Of course as you look closer you will see that there are spaces in-between the smaller particles and it really is like a fractal. The next range down is silt and ranges between 0.06 mm to 0.0039 mm. This particle would be able to close those gaps and so you go. So with sand you are looking for two things primarily, a shattered particle and a good distribution of particle sizes. Clay is the magic that does the binding in earth building. Clay is completely different to what has been mentioned above, except that there is some relation to particle size with silt. If you went to the beach and made a sand castle you will find when it was dry and you apply a little pressure, you flatten it, especially with those rounded particles. Do the same with clay and once it is dry it is immensely strong. This is because clay is not just a smaller sand particle but rather a flat platelet that is held together by electrostatic force. It works in a similar fashion to a drop of water between two pieces of glass – you can slide them apart but you can’t pull them apart. The trick with clay is to work the material until the particles are lined up to allow the electrostatic forces to work. There is always enough humidity in the air and retained in the clay to allow this process to continue, even in very dry conditions. Clay and silt are often found together in the same deposits and are hard to tell apart if they are mixed together. 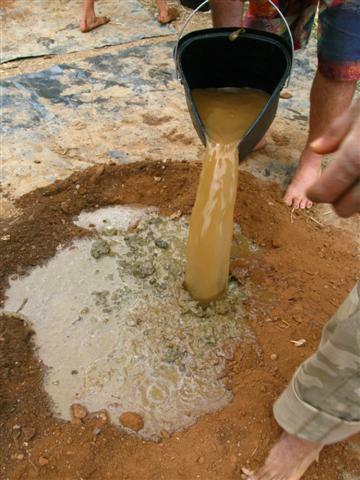 Mostly what is termed as a clay earth is a mixture with silt. I consider 60% a reasonable clay content . Clays also all behave differently. 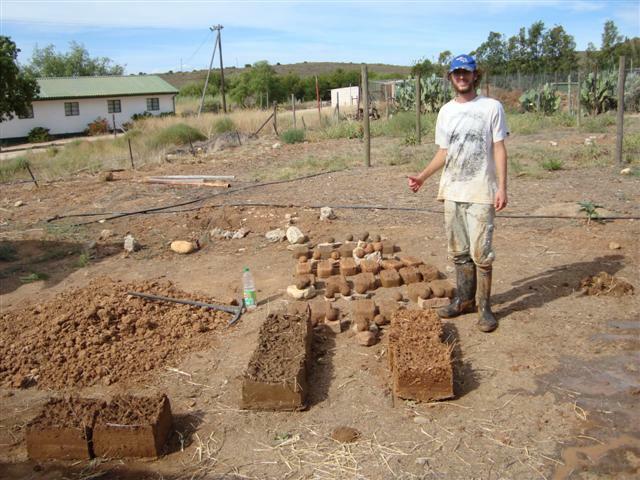 Some clays swell considerably when water is added and are great for the sealing of dams and the like, but no good for building with cob or mud/adobe brick, as this leads to cracking in the drying process. Really fine clays also tends to be brittle, such as Kaolin, a fine white clay. So with clay you are looking for a nice high percentage with as little silt as possible, not too fine. And one that does not swell to the point of compromising the strength of the material with excessive cracking once dry. Now to create a building material both sand and clay are blended together, to get the benefits of the structure of the sand with the binding properties of clay. Basically you just want to add enough clay to coat the sand particles and close the last of the gaps left between them and allow the electrostatic force to hold it all together. You certainly do not want silt as that is competing for the space between the sand particles and is just where you want the clay to be. At around 18% there would be just enough clay to do the job. If there is silt present with the addition of 18% clay you would begin to force the sand particles apart and you would have a more brittle material, as the material is strongest when the sand acts as a bridge over each other, locking together. But that’s the theory, in reality you are dealing with what is available and that is always going to be less than perfect. Your sand may have only large and small particles and nothing in between or any number of permutations, depending on how nature left its deposits. Your clay may be a mixed bag of various amounts of silt and swell in a less than perfect manner. So what you are looking for is not the ideal, that does not exist, but rather something that is suitable and strong enough for your needs. Different methods can help with how the material behaves so choice of approach is important. Blending and lining up of the material can be done in essentially two ways and both have their benefits and drawbacks. The first is to add water and mix the material until well blended to achieve a good lining up of the particles. Different methods allow for different quantities of water, however the addition of too much water can lead to avoidable cracking or a material with less compressive strength. Cob is often the standard most people refer to and also has some added straw (straw adds to the insulation value and tensile strength of the material) The cob mix needs to be stiff enough to resist slumping when placed on a wall to the height of 300 to 500 mm. One of the benefits of using water is that different earth can be easily blended and straw can be added, a drawback may be that if the clay is aggressive or of a high overall percentage it could lead to cracking and a weakening of the material. The second method of lining up the particles is to put the material under pressure and not to add water beyond just slightly damp. The material can be stamped such as for rammed-earth or compressed such as with a compressed earth block. A benefit could be that as you are not adding water, there will be less cracking, even if the clay content is high. A drawback is that earths are not easily mixed together without water unless you have other machinery so a single earth is often used and the addition of straw is not possible. 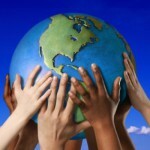 Understanding how earth behaves is key to choosing a method of approach that supports the materials you have on hand. Earth requires two properties to make it strong enough for building – compressive and tensile strength. In much the same way that steel works in concrete, they can’t be looked at in isolation as they work together. For example, even though concrete when supported can take an enormous amount of pressure or compression without disintegrating, if you were to cast a concrete lintel without steel and suspend it between two points and apply pressure, it would snap. Steel has enormous strength in tension, while concrete has enormous strength in compression. Compressive strength is measured in Megapascal (MPa). One atmospheric pressure is 101 325 Pascal; a Megapascal is more-or-less one million Pascal, or 10 times atmospheric pressure. In other words, one MPa is 10 times stronger than it needs to be to resist the force of gravity on earth, stand on its own and not be crushed. 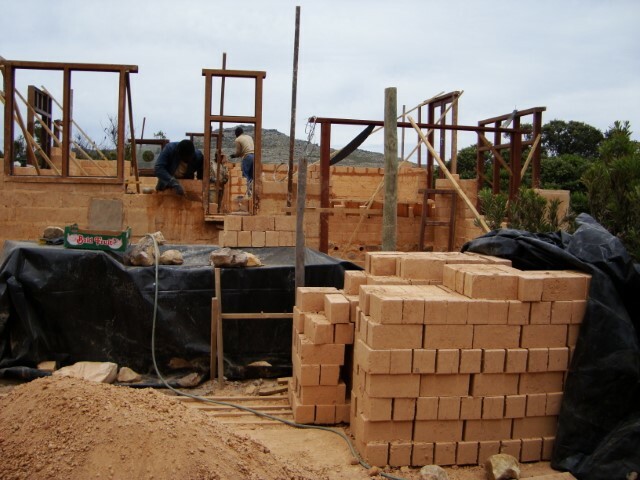 A good mud-brick has a MPa strength of around 1.6 to 1.9 MPa, while a clay-fired brick has an MPa strength of around 14. Concrete ranges between 15 and 25 MPa. Obviously these figures vary widely, but these are good averages. A mud-brick at 1.4 MPa is 14 times stronger than gravity, a clay-fired brick at 14 MPa is 140 times stronger than gravity or 140 atmospheric pressures. The bricks ready to be tested on a hard surface. Tensile strength is found in all material, just in varying degrees. Concrete as we have seen has high compressive strength, but relatively low tensile strength. The addition of steel (reinforced concrete) increases its tensile strength. 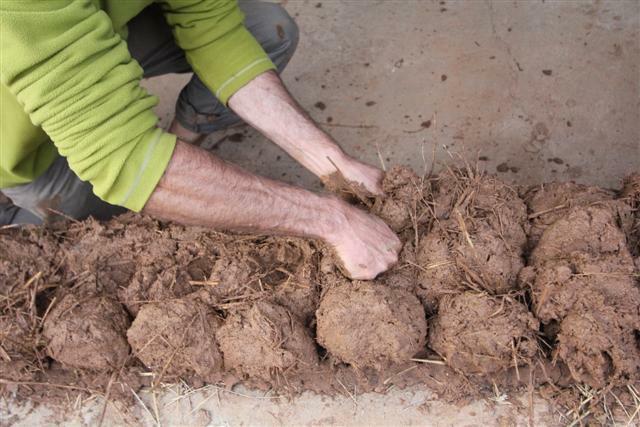 Mud bricks can handle 14 atmospheres, but like concrete they have poor tensile strength. However, as clay is somewhat plastic in its behaviour it’s not as poor as one may think. rittle. Thus, clay buildings are often more resistant to cracking, because they can absorb the movement that harder more brittle materials may not. 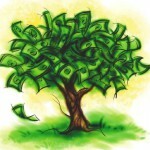 When building with earth, strong enough is what you are aiming for. At 1.3 MPa, a double-storey building is already seven times stronger than it needs to be. However, given window and door openings and the fact that the gravitational forces need to be transferred around them, 1.3 MPa just covers it with a safety margin. It is important to grasp that it does not matter at all if you used clay bricks at 14 MPa, once something is strong enough, the extra strength means nothing at all. 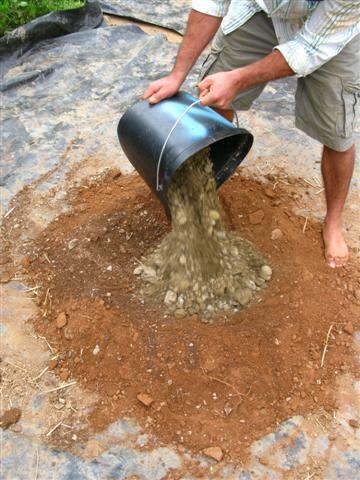 Make a brick using the cob method (that is using sand, clay and straw ) and a 2 litre ice-cream tub as mould. Number each mix and mark your bricks and balls. Allow the bricks to cure for 3 weeks minimum in the sun. A brick is considered cured after 3 months, but I have found that 3 weeks gives you a really good idea, after all it will only get stronger. Drop the brick from waist height, onto a very hard and flat surface and observe how it breaks up. If it shatters it is no good; breaking into a few large pieces is acceptable. Often enough it does not break at all, which is fantastic. Observe the cracking. Surface cracks, no deeper than a cm are fine. Cracks that run deeper compromise the material. They may be due to a very aggressive clay or because there is too much clay in the material. There can be other causes of the cracking, such as the addition of too much water or uneven drying of the material. Stitching the cob onto a wall. Make tennis ball size balls using the cob method and allow to cure, as above. A ball has a point and you are testing the point load. Remember to mark the balls. Place the ball on a hard and flat surface. Stand on the ball with your heal and slowly increase your weight on the ball until all your weight is suspended on it. My weight is around 80 kg and I know that if the ball crushes just before all my weight is suspended the MPa strength is 1.3. If it takes all my weight then the MPa strength is at least 1.4. As you gain more experience and your frame of reference increases you can quite accurately gauge greater MPa strengths by gently bouncing with your heal on the ball. At around 1.8 MPa the balls are very resistant to crushing with the heal, even with repeated bouncing; but then it does not matter because the material is already more than strong enough. Both the compressive and tensile strength tests need to be passed for the material to be good enough to build with. Of course, if the material fails this tests it does not mean it can’t be used, especially if cracking is the result of failure. You can try excluding water and instead try ramming the material as a way of lining up the particles and see if that will works; or try making compressed earth bricks or even a sand-bag house? Bottle, tongue and touch are all good indicators of how an earth is composed, but nothing beats compressive and tensile testing. Place 4 cm of the earth in a 400ml bottle, add water and a teaspoon of salt to help it settle and shake it all up. It will give you an indication of the particle ranges you are dealing with and their ratios. However beware you will not be able to tell the difference between sand and silt. To check if clay is present, make the material very wet and rub between your hands, then dip your hands in water, if the material sticks then there is clay present if it falls away then there is mostly or only silt. Resistance to water erosion is dealt with separately in the plaster stage which will be dealt with later. First walk the area you have to source your materials and then collect samples from various sites. Here I located 2 distinct earth types. White building sand was located close to the farm. Make observations of the material so you can begin to make rational choices for you mixes. Red earth located in the South East corner of the property. This earth appears to have a high clay content. It is also attractive in colour. Made up of fine sand clay and unspecified amount of silt Brown earth located to the North. This earth appears to have a higher sand content although very fine. Certainly has a lower clay content than the red earth. White sand located to the South on a neighbours farm. This sand has a particle range that excludes finer particles and is angular and not rounded. It was established that the red earth has a high clay content. Certainly above 60% as the bricks with 20% red earth and 80% white plaster sand were only just below minimum building strength. As soon as the ratio of red earth reached 33% it was obvious that the bricks passed both a compressive and a tensile strength test. It is estimated that the MPa strength at 33% is 1.4. Above 33% red earth and the bricks harden a lot. The brown earth from below the dam could be used as a filler with the red earth, but this was decided against as it is in valuable agricultural land. It is not suitable on its own. The addition of straw added to the tensile strength of the material in all cases. The red earth bricks displayed deep cracks indicating a high clay content. Once 50% sand was added the cracking was acceptable. The addition of sand will ensure that this does not happen and is a good enough reason to not use the red earth on its own. The tests done with the white sand and red earth were strong enough from 33% red earth. A second test was also done with 50% red earth and 50% white sand which delivered a brick over 1.6 MPA. It was decided that, because the white sand was easy to access with little environmental damage and because it would eliminate cracking, that the addition of 60% sand was the most favourable option; 40% red earth just to remain clear of the 33% mark that we know is good, in case the earth varies slightly. 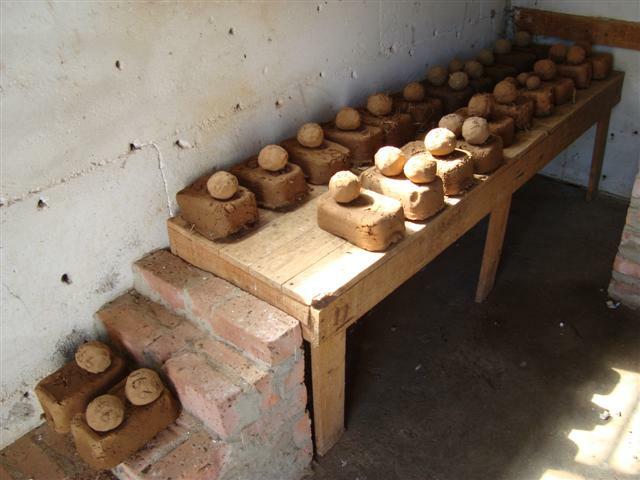 Compressed earth bricks using red earth only are strong enough and has no cracking. It is interesting to note that the red earth was suitable as a building material on its own if it were not for excessive cracking due to the swelling of the clay with water. If one uses compression as a method of lining up the particles and so exclude water, the earth can be used as it is. In conclusion, often when doing tests with different earths you will find that a number of your samples will pass both compressive and tensile test. This allows you the freedom to make choices affecting sustainability or aesthetics; such as how far the material has to travel, how easy ii is to gather the material and what environmental damage is being done. Remember that you are not looking for the strongest sample, but rather the one that makes the most sense after it has passed the tests. Strong enough is strong enough. In his next blog Peter will look at plastering of a building where the walls are able to resist the erosion of rain and the beauty of the material shines through.